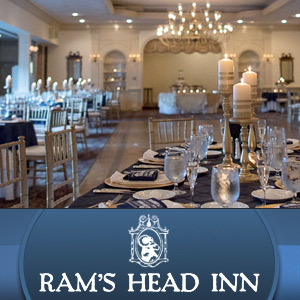 Classic elegance, romantic charm, award-winning cuisine and an attentive staff are among the reasons the Ram’s Head Inn sets the standard for wedding venues in southern New Jersey. Whether your wedding plans include hundreds of friends and family, or plans call for a small, intimate ceremony, the staff of the Ram’s Head Inn is dedicated to making your wedding day dreams come true. Our wedding planners and banquet managers enjoy working with brides-to-be on all the details that go into planning a wedding. From the procession right through your wedding banquet, we ensure everything is taken care of so you can truly relax and enjoy your special day. We’ve hosted weddings and commitment ceremonies going back four decades, and we take pride on working within your wedding budget to create a truly unique and wonderful ceremony.